Been reading about all the LCD installation and have not see a 7" screen mod yet. My question is, will this work? 7.25 x 4.5 x 1.25 is the dimension as compare to the Alpine TME-M760 6.5" shown here which is 7.72 X 4.72 x 1.12. So it's a a bit smaller but deeper. This would look AWESOME, fill the whole space with the screen. question is how would this be mounted? I've seen pics of finished ones, but never seen one installed. What actually holds the screen in place? I know theres not much room there so will that 0.13 of an inch get in the way??? Unfortunately a 7 in. screen will not fit (at least without MAJOR modification). I had a panasonic 5.8 in. screen installed and it fit perfectly...on the other hand, I wanted a 7 in screen but couldnt find a way to get it done without cutting. Hope this helps. personally, the option is ones choice... i would go with the 7inch and custom install it, due to the fact that, i do not plan on selling the car... i like to keep my cars... but anyways... but if there is a thought about selling it in the future, then i wouldnt get something that would require damaging the OE part. How can it not work?? Nazar here installed an alpine unit which is bigger than the farenheit T-7001MHR which is an inch wider an about a quarter of an inch taller and 1/2 in deeper?? I mean this seems doable, the farenheit 5801MH which seems that alot of people like to use (5.8" screen) is an inch by 1/2 inch smaller, but from pictures it looks like it can spare it. Now I haven't open the dash and checked but what is the opening size? Also how is the Farenheit screen mounted?? maybe there's a work around, cause isn't the Nissan screen a 7", if so how did they fit it in?? Thanks for the input, but this would be soo cool if it works. Don't want to buy and try unless I know for sure this could work. A 7" wide screen will fit no problem with no cutting at all. I took my dash apart and tried a kenwood LZ-701W screen and it fit like a glove. It clears the side slides for the nav door and has enough clearance on all sides... the only problem was that is has buttons below the screen that would not clear. The screen was almost edge to edge though, only a 1/16 of the kenwood plastic housing would show. If it didn't have the buttons on the bottom it would be in my car right now. Now i'm looking at the Farenheit 7" wide and the Rosen unit. I'm waiting for a larger screen also. 5.8" is nice, but 7" is better. Hopefully, the Farenheit screen will fit. Rosen is a company that makes a very nice LCD screen system. they make many screens for the OEM car companies and for aircraft. I think I am going to start keeping a listing of different screens that people have installed, or are thinking about installing. I'll eventually add links to the specs, photos, and where to buy. If you'd like to add some information, or a new model, or a link, please let me know. I'll have a link to it from the main Soup Page, but for now, it is located here. Let me know if you find this useful, as we try and compare our options. Last edited by Scafremon; 10-31-2002 at 09:27 PM. 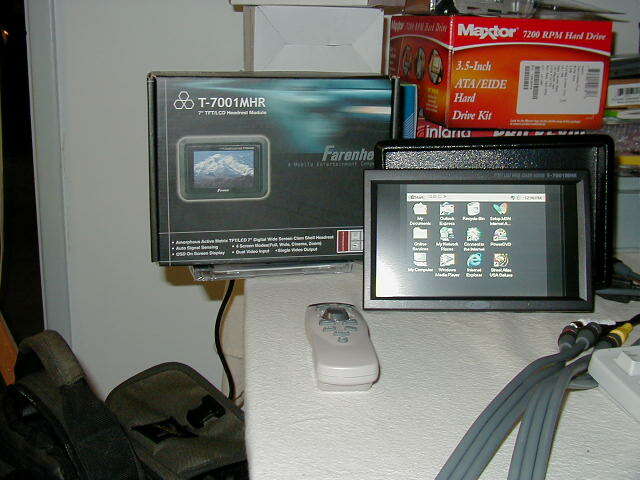 The physical size of the screen on the Farenheit T7001MHR is the exact same size as the cubby hole. If you installed it, you wouldn't use the headrest sleeve, like you do with the 5.8" unit. I haven't installed mine yet, but plan on soon. Nice to see that a 7" fits. The Farenheit screen has 2 inputs right? Is that remote for it's control.....doesn't look like it. What are the exact dimentions on the Faranheit 7" that fits perfectly. Becuase on Ebay you can pic up a 7" for $200 easily, there all over the place! Do you reccomend putting Playstation, or X-box in as your DVD player?? Also are there any cheap DVD based navigations systems that would work well with these screens? Not those $1500 Alpines? I have a PS2 and my old flatmate had an X-Box. 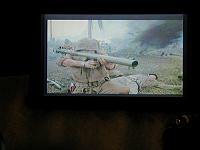 For what it's worth, we did some back-to-back testing and we found the X-Box had nicer DVD picture quality than the PS2. Granted, neither of them were as nice as my Denon dvd player, but game consoles usually aren't as nice as dedicated dvd players when it comes to playing DVDs. A computer would be a cure all (maybe a laptop). You can play dvd movies, hook up to handheld gps for a navigation system, put wireless card for internet access, etc. Only problem would be the size of the screen and text size. What is that a CE type operating system. Where's the remote control sensor? Does it look like you will have to cut into the cubby hole using this this monitor? Since I haven't taken apart the dash yet, I'm not sure what cutting will be required, but yes, there will be cutting. Since the screen is same size as cubby hole front, a complete border will have to be cut out behind the cubby hole front. I'm assuming there are at least 2 pieces to the dash assembly, so the piece you cut will not be visible. Yes, there is a small infrared sensor on right frame of unit, so a small hole or notch will have to be cut to make this visible. Probably no bigger than a pin-head. If everything works, I'll be using a windows based mini-atx computer with a dvd drive for my player. The only hurdle I am trying to jump right now is the getting a windows based navigation system to be legible on this small screen. Researching options on this now. I've decided to sell my 7" screen. My research tells me that I need a VGA screen if I want to get a clear resolution from a computer. This Farenheit screen is great for playing DVD movies, with it's 16:9 format. I bet it would also work great as a Navigation screen, but possibly would need a RGB converter. But for a computer monitor, it isn't going to work. If you are interested in buying it, please let me know.